Over the years you've probably had your share of barbecued chicken legs—drumsticks cooked on the grill, coated with sauce—and some may have been better than others. Once you taste this recipe, though, it will be the only one you will use when making barbecue chicken on the grill. 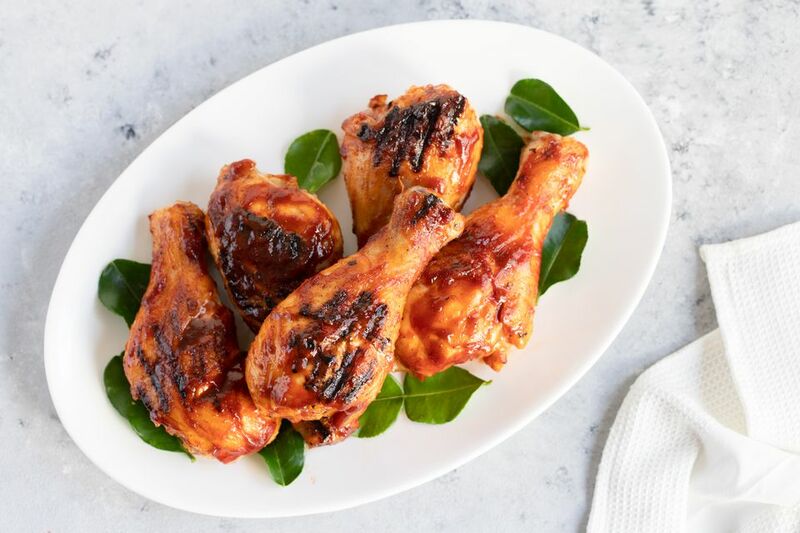 These drumsticks are brined first to create optimal moisture and tenderness, and then are slowly grilled and basted with a classic BBQ sauce at the end of cooking time. While this recipe contains ingredients for making a homemade sauce, feel free to use your favorite bottled sauce if you prefer. To make the brine, combine salt, white sugar, and hot water in a large plastic or glass container that you can cover. Stir to mix. Add cold water and cayenne, if using. Continue stirring to dissolve. Add chicken drumsticks, cover, and refrigerate for 4 hours. Meanwhile, gather the ingredients for the sauce. Make barbecue sauce by combining ingredients in a medium saucepan. Simmer over low heat for 15 minutes, stirring occasionally. Remove from heat and allow to cool for 10 to 15 minutes. Preheat grill to a medium-low heat (around 275 F/135 C). Remove the chicken legs from the brine and discard brine. Rinse chicken thoroughly to remove all traces of the brine from the surface. Pat dry with paper towels. Grill chicken legs for about 30 to 35 minutes, turning often (about every 5 minutes) to make sure all sides are cooked evenly. During the last 15 to 20 minutes, start brushing sauce over the surface every 5 minutes, rotating the chicken to coat evenly, until the chicken is done (an internal temperature of should be at least 165 F/75 C, but you may want to get closer to 180 F/82 C), and the sauce has cooked down to a sticky consistency. Remove chicken from heat, place on a large serving platter, and tent loosely with aluminum foil. Let drumsticks rest for 5 to 7 minutes. While using a brine is great for creating moist, tender drumsticks, it also leaves you with very wet chicken legs. Chicken skin that has moisture on its surface will not crisp up well when cooked (no matter the cooking method), so it is crucial that you dry the drumsticks thoroughly after removing from the brine. If you have time, after patting with paper towels, you can place on a cooling rack over a baking sheet and let sit on the counter (or the refrigerator if a longer period of time) until the skin is completely dry. Whether you use this recipe or your favorite bottled barbecue sauce, sugar is most likely an ingredient. Sauces and marinades that include sugar can cause flare-ups on the grill, so it is important that once you begin applying the sauce you keep a close eye on the chicken. If you do get a flare-up, quickly move the chicken legs to another part of the grill, rotating them as you do to assure even cooking and no burnt skin. You can easily change the flavor of this recipe by altering the ingredients in the brine and/or barbecue sauce. From pickling spices to hot sauce to citrus to pineapple juice, there are several ways to season a brine. The same goes for BBQ sauce; depending on where you are in the United States, barbecue sauces range in ingredients and tastes, from sweet to spicy to smokey. Try new ingredients to make your own favorite BBQ sauce. The brining and sauce method will work for other cuts of chicken. You may need different grilling times for thicker breasts. You can also use this BBQ sauce on any protein, including grilled salmon or pulled pork. You may have heard of brining a whole turkey for Thanksgiving, but barbecued drumsticks for the grill? They are both poultry on the bone, so why not? A brine—which is essentially a mixture of salt and water, often with seasonings—tenderizes the flesh, breaking down any tough fibers, resulting in a really moist meat once it is cooked. And when spices are included in the brine, the liquid mixture will infuse flavor deep into the chicken meat, perfect when you are making BBQ chicken on the grill and only adding sauce at the end of cooking time.